Your trip to Lucknow will not be complete without a visit to Bithoor, the town holding great religious and historical significance. Bithoor is a picturesque town, situated on the banks of the river Ganges, which lies on the Kannauj road, at a distance of 18 kms from the capital city of Lucknow. According to the Hindu mythology, this holy township was chosen by Lord Brahma as his abode during reconstruction of the galaxy by Lord Vishnu, and thus attracts visitors in big numbers from all parts of the country. Bithoor is well connected to Lucknow by road and offers you peaceful and calm surroundings, an ideal retreat, away from the hustle and bustle of city life. Bithoor attracts visitors in big numbers around the year, due to its religious associations. As the legend goes, it is believed that Bithoor is the place where Goddess Sita took refuge in the ashram of Saint Valmiki after Lord Ram banished her from Ayodhya. It also owns the distinction of being the sacred place where Goddess Sita gave birth to twins, Luv and Kush. Bithoor is also associated with the unison of Lord Rama with his sons Luv and Kush, who spent their formative years imbibing the techniques of war and governance under the guidance of Saint Valmiki. Thus, this town is also known by the name of ‘’Ramale’’. Saint Valmiki is said to have meditated at this site and penned the most revered epic of the Hindus, ‘The Ramayana’. Bithoor also played a very crucial role in the mutiny of 1857, bearing witness to the first bombardments of the rebellion. During those times, it was home to some of the prominent figures of the Indian freedom struggle including Rani Laxmi Bai and Nana Sahab Peshwa. These illustrious freedom fighters played instrumental roles in the freedom movement and are known for their heroism, loyalty and patriotism. Valmiki Ashram: Valmiki Ashram has great religious significance, being the place where Goddess Sita stayed after Lord Ram left her. This is also the site where Goddess Sita gave birth to Luv and Kush and Saint Valmiki penned the classical epic, “The Ramayana”. The town attracts visitors from all walks of life. A flight of steps known as “Stairway to heaven’’, takes you to the ashram, which offers you a panoramic view of the township. Brahmavart Ghat: This is one of the most sacred ghats of Bithoor, where the devotees of Lord Brahma take a dip in the holy river, and offer their prayers at the altar of the ‘’wooden slippers’’. This ghat is one of the prime attractions that lends Bithoor a beautiful landscape. Patthar Ghat: This red stone ghat is an epitome of outstanding art and architecture, whose foundation stone was laid by Tikait Rai, the then minister of erstwhile Awadh. 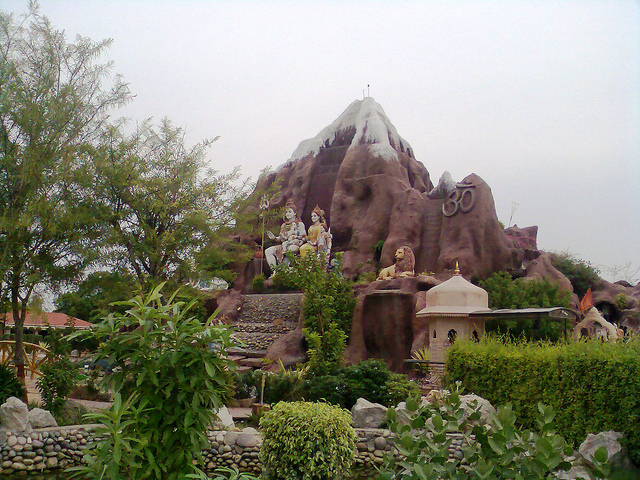 It also has a huge temple of Lord Shiva which is an epitome of peace and serenity. A visit to Bithoor will not be complete without a visit to this ghat, which is suffused with holiness and tranquillity. Dhruva Teela: Legend has it that child Dhruva meditated at this place on one leg. God was so pleased with his devotion that He granted him a boon that he will shine as a star for all times to come. This teela or hill is one of the chief attractions of this holy town. Other places of Interest: Beside the above mentioned places, the serene town of Bithooris also home to other sites such as Ram Janki temple, Lav-Kush temple, Haridham Ashram and Nana Saheb Smarak that are sure to fascinate you on the historical as well as religious fronts. The township of Bithoor, replete with divinity and spirituality, should be high on your list of getaways, on your visit to Lucknow. You can drive down to this place to take in the inner peace, relaxation and serenity that its beautiful surroundings offer you. Go for it! Happy International Women’s Day, 2019!